"Emerging Approaches in Development Efforts: Chinese Perspective on Space and Sustainable Development"
Abstract: The issue of sustainable development came to the forefront in view of the increasingly serious concerns over space debris. However, this is only the vertical aspect of sustainable development in outer space: space sustainable needs to take into account the horizontal aspect of sustainable development, i.e. all the countries, irrespective of their economic, social and technological developmental levels, should be able to benefit from outer space and space activities. This paper aims to examine new approaches and new perspectives in realizing space sustainability through international cooperation, with China as an example. China's efforts in promoting space cooperation through overseas assistance program exemplify the importance of financial and non-financial assistance efforts in the realization of the horizontal aspect of space sustainability for both space-faring and non-space-faring nations. 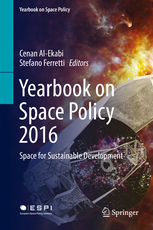 Space sustainability cannot be achieved without taking into account the interests of developing countries. The China-Brazil cooperation presents an excellent example that space cooperation can take place between and/or among developing countries. While benefiting one state at one stage, space cooperation will bring benefits to cooperating countries in the long term: such benefits will not simply be restricted to these cooperating counties, with proper arrangement, other states can similarly benefit from such cooperation. The paper concludes that space sustainability, as an issue for both space-faring and non-space-faring nations, regardless of their level of economic and technological development.